Weekends for me are the heavy cooking time which involves 'Keralite or Indian food'. My hubby and kids look forward for Keralite breakfast on weekends. For some reason, if I am late to wake up in the morning, hubby will make his special 'Upma' (Indian breakfast made with Semolina) :). I always encourage him so that he would do it again :)..even though I have to clean up the mess he makes in the kitchen after his cooking. But you have to appreciate the help you get rather than complain right? So I suppress my urge to say "Don't put the Upma spoon directly on the counter top, place it on a plate" and embolden his cooking. If we had a late movie night on Fridays I go for the quick and easy breakfast like Pan Cakes, Waffles etc. Homemade Waffles and Pancakes are lately taking the place of weekend Keralite breakfast. Does that mean that I am getting too lazy? I have my days you know.... Anyways we make these waffles using my hubby's waffle maker, which he used during his college days. I don't think he ever used it even though he claims that he used to cook :). It still works, so I never bothered to buy a new one. Besides the older appliances works better and are reliable. 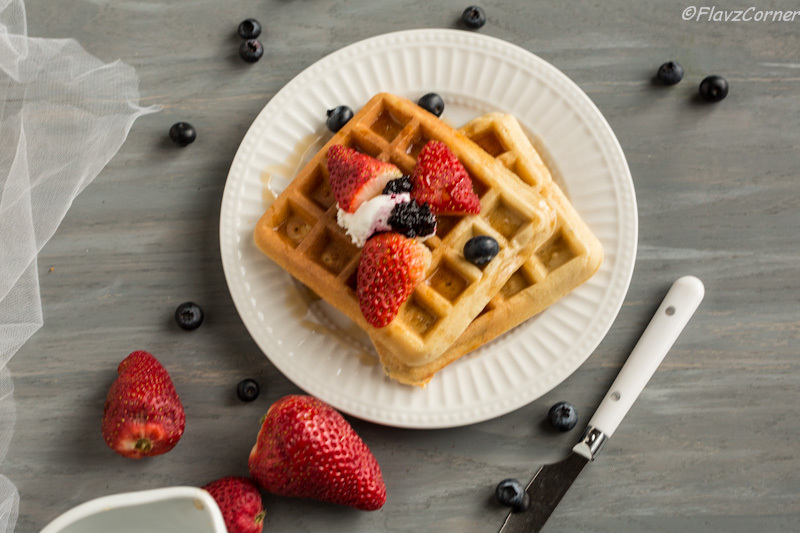 It is always good to know what goes into your food, so homemade waffles are healthy choice when compared to the store bought pancake or waffle mix. I sprinkle flax seeds or chia seeds depending on their availability in my pantry. Feel free to add the adds-on per your taste. 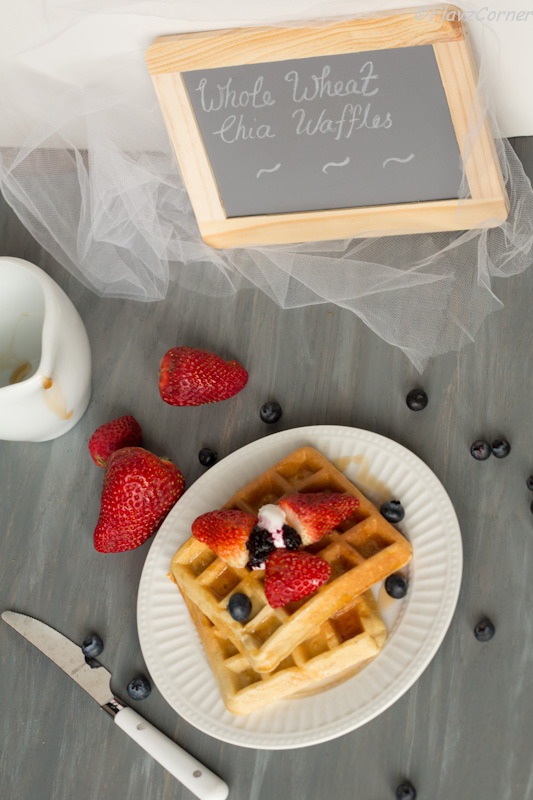 Think about a plate with warm waffles topped with some fresh strawberries, jelly, maple syrup and whipped cream sitting on your breakfast table waiting for you to take the first bite. Isn't that inviting? If I triggered the cook in you, go ahead and make this for your loved ones, your family will definitely enjoy it!!! You can use a blender or an electric mixture for making the batter. Mix the milk, eggs, vanilla extract, sour cream or yogurt and oil till they are frothy. Now add the dry ingredients into the wet mix and blend on high speed for 10 -20 seconds. Let the mix stand for 5 minutes. Pour the batter into the waffle maker and cook the waffles according to the waffle maker directions. Serve the warm waffles with the toppings of your choice. I serve them with pure maple syrup, fresh berries, homemade jelly and a dollop of whipped cream. You can sprinkle the chia seeds on the waffle once the batter is poured into the waffle maker if you prefer to see the chia seeds on the waffles. I usually mix it with the batter to make my job easier. 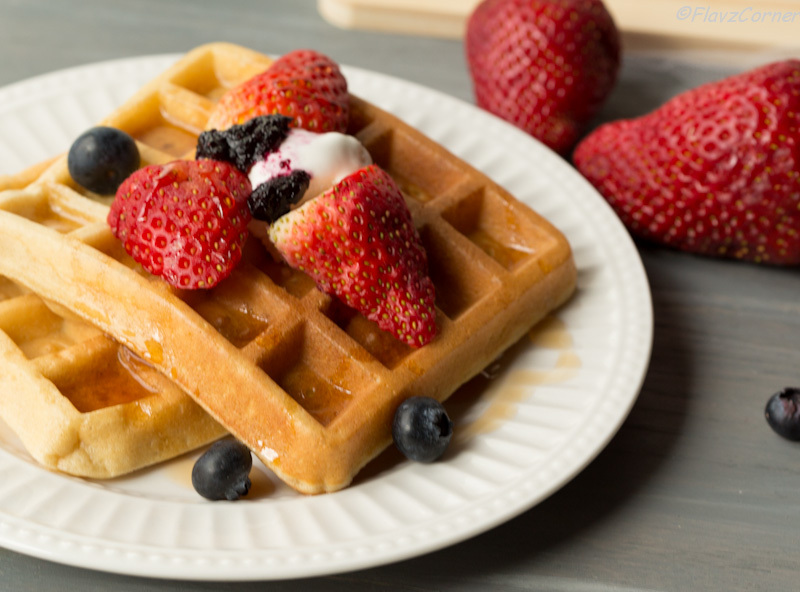 You can substitute 1 cup of wheat flour with 1 cup of all purpose flour if you don't like the wheat flour waffles. But trust me on this, you won't even notice the difference, they are soft inside and crispy on the outside and tastes better than the regular flour waffles. The topping always add the jazz to the waffles, so make sure to use your favorite toppings. I agree old appliances are better! I've never had a waffle iron - something I should really get. Lovely recipe. Even though I've had breakfast, I'm hungry again for it! Thanks for this. I cook a lot on a weekend also. It is a family time, nice to bake something for everyone. Breakfast is also very important. I love your recipe. Sounds very tasty and healthy.